The Aida scene was a strange choice with which to end the movie. Lanza is in magnificent vocal form, but he looks edgy as he stands on the stage of the Rome Opera House. At the very least, the director could have shown him basking in the audience's applause or blowing kisses to Johanna, rather than leaving us with a final look of anxiety. Perhaps Lanza was merely acting out the role of Radames, but the scene is awkward nonetheless. The other operatic scenes were more skillfully handled, with the brief Così Fan Tutte scene a delightfully sung and acted vignette. The director should have been spanked, however, for letting Lanza put out his arm to break his fall in the Otello scene. After all, Otello has just stabbed himself, and falling comfortably should be the last thing on his mind! The Pagliacci scene is the highlight of the film. While the cutaways (for plot purposes) to Von Koczian and Sohnker are distracting, the scene is heartrending whenever the camera is on Lanza. I will not repeat my critique of his singing from an earlier essay, but I will say this: one could not wish for a more effective Canio, either vocally or visually. Lanza lip-synchs to his recording most effectively on the climactic high A, and equally affecting is the way he looks down with unbearable sadness after he has finished the aria. 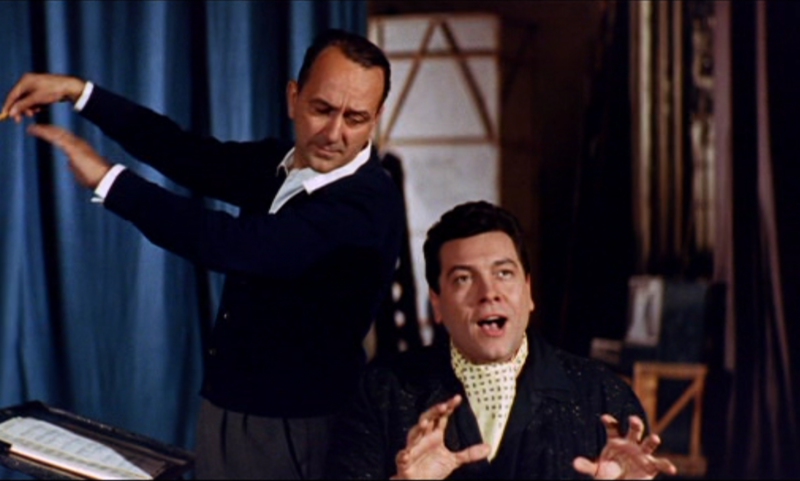 Sonhker later wrote that in this scene the tenor "made an unforgettable impression on me, both as a singer and as an actor. In fact, [Lanza] stood on the stage like a wounded deer." This scene would subsequently provide a most moving conclusion to the 1983 documentary Mario Lanza: The American Caruso. Among the non-operatic moments, "O Sole Mio" and the rousing Hofbrauhaus Song stand out as well-filmed accounts of Lanza in ringing vocal form. Schubert's "Ave Maria" is nicely sung, but marred by an unfortunate close-up of a very tired-looking Lanza. Among the remaining selections, my one regret is that we are treated only to the very last part of I Love Thee. This is a different version from the more subdued rendition featured on the soundtrack album, and Lanza dazzles with his soaring upper register. Properly filmed in its entirety—with Lanza in concert mode—this, too, could have served as a thrilling conclusion to the movie. But weak moments aside (and there are plenty of them), the film still has a lot going for it. To be sure, For the First Time will never win any prizes for cinematic achievement, but for this viewer, at least, it continues to provide pleasure long after far more acclaimed movies of its era have been forgotten. In short, it's a sweet little gem of a movie, and I hope that Lanza was proud of it.